While we can’t stop growth, SQL Server 2008 (Enterprise Edition only), gives us some new tools to help us better deal with all this data, and that is the promise of compression. Given the right circumstances, DBAs can use data compression to reduce the size of our MDFS, and backup compression can help us reduce the amount of space our backups take. Not only does compression reduce physical file sizes, it reduces disk I/O, which can greatly enhance the performance of many database applications, along with database backups. When we discuss SQL Server compression, we need to think of it two different ways. First, there is data compression, which includes row-level and page-level compression that occurs within the MDF files of our databases. Second, there is backup compression, which occurs only when data is backed up. While both of these are forms of compression, they are architected differently. Because of this, it is important to treat them separately. 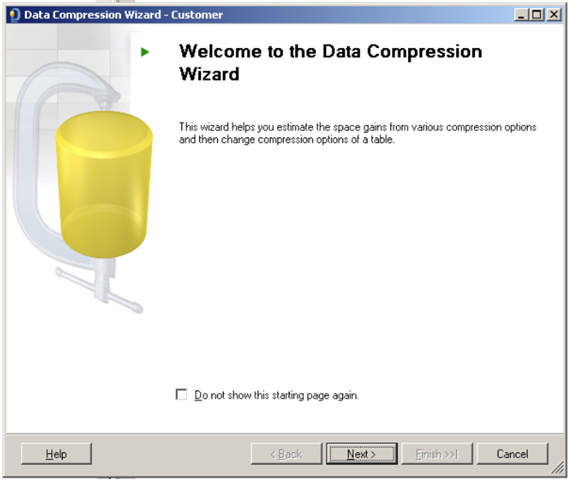 In the next section, we will take a high-level overview of data compression, and then we will drill down into the detail of the different types of compression available with SQL Server 2008.
other words, every time data has to be passed to or from the Storage Engine, it has to be compressed or uncompressed. While this does take extra CPU overhead to accomplish, in many cases, the amount of disk I/O saved by compression more than makes up for the CPU costs, boosting the overall performance of SQL Server. Here’s a simplified example. Let’s say that we want to update a row in a table, and that the row we want to update is currently stored on disk in a table that is using row-level data compression. When we execute the UPDATE statement, the Relational Engine (Query Processor) parses, compiles, and optimizes the UPDATE statement, ready to execute it. Before the statement can be executed, the Relational Engine needs the row of data that is currently stored on disk in the compressed format, so the Relational Engine requests the data by asking the Storage Engine to go get it. The Storage Engine (with the help of the SQLOS) goes and gets the compressed data from disk and brings it into the Buffer Cache, where the data continues to remain in its compressed format. Once the data is in the Buffer Cache, the row is handed off to the Relational Engine from the Storage Engine. During this pass off, the compressed row is uncompressed and given to the Relational Engine to UPDATE. Once the row has been updated, it is then passed back to the Storage Engine, where is it again compressed and stored in the Buffer Cache. At some point, the row will be flushed to disk, where it is stored on disk in its compressed format. Data compression offers many benefits. Besides the obvious one of reducing the amount of physical disk space required to store data—and the disk I/O needed to write and read it—it also reduces the amount of Buffer Cache memory needed to store data in the Buffer Cache. This in turn allows more data to be stored in the Buffer Cache, reducing the need for SQL Server to access the disk to get data, as the data is now more likely to be in memory than disk, further reducing disk I/O. Row-level data compression offers less compression than page-level data compression, but it also incurs less overhead, reducing the amount of CPU resources required to implement it. For years, there have been third-party programs that allow you to compress and speed up SQL Server backups. In most regards, the backup compression included with the Enterprise Edition of SQL Server is very plain vanilla. In fact, if you already are using a third-party backup program, I would suggest you continue using it, because SQL Server 2008 backup compression offers fewer features. In fact, the only option SQL Server 2008 backup compression offers you is to turn it off or on. That’s it. 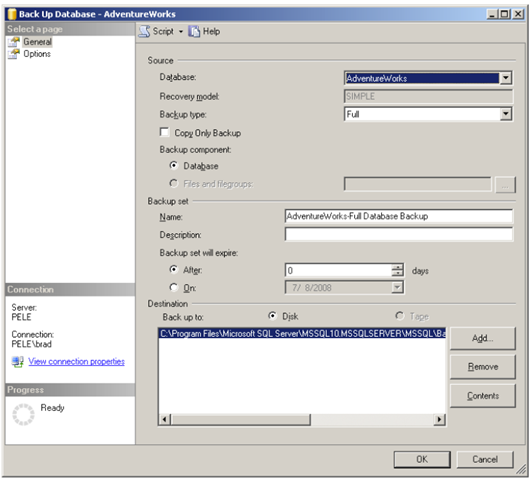 SQL Server 2008 backup compression, like the third-party add-ons, compresses backups, which not only saves backup space, but it can substantially reduce backup times. Unlike data compression, there is very little downside to using backup compression, other than the additional CPU resources required to perform the compression (or decompression during a restore). Assuming that you perform backups during slower times of the day, the additional CPU resources used will not be noticeable. The time and space savings offered by backup compression depends on the data in your database. If you are heavily using data compression in your databases, or are using Transparent Data Encryption, then using backup compression probably won’t offer you many benefits, as already compressed data, or encrypted data, is not very compressible. Let’s take a brief look at how you turn on SQL Server 2008 backup compression. While our example will use SSMS, you can use Transact-SQL to perform the same task. To backup AdventureWorks, right-click on the database in SSMS, select “Tasks,” and then select “Back Up,” and the backup dialog box appears. Figure 7: As with any backup, you can use the backup dialog box to make your selections. Once you have selected your backup options, next click on “Options,” and the following screen appears. Figure 8: Backup compression options are limited. At the top of figure 8 are the standard backup options, while at the bottom of the screen you see the options for backup compression. Notice that you only have three choices. The first option, “Use the default server settings” tells the backup to use the server’s default backup compression setting. 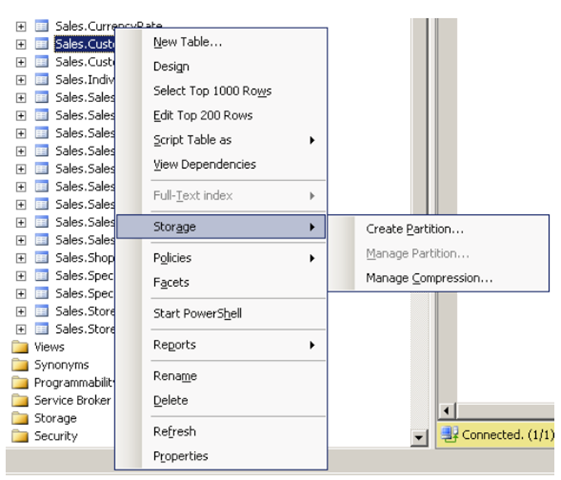 In SQL Server 2008, there is a new sp_configure option called “backup compression default.” By default, it is set to have backup compression off. If you want, you can set this option so that backup compression is turned on by default. So if you choose the “Use the default server settings” option above, then whatever option is set for the “backup compression default” will be used for the backup. The “Compress Backup” option turns backup compression on, and the “Do not compress backup” option turns it off. Both of these options override the “backup compress default” server setting, whatever it happens to be. Once you have chosen your backup compression method, you proceed with the backup just like any other SQL Server backup. If you need to restore a compressed backup, you don’t have to do anything special, it will uncompress itself automatically. Although you can only compress backups using the Enterprise Edition of SQL Server 2008, you can restore a compressed backup to any edition of SQL Server 2008. On the other hand, you cannot restore a compressed SQL Server 2008 backup to any previous version of SQL Server. In this article, we have learned about the two forms of data compression, and about backup compression. While data compression might seem like a seductive new feature of SQL Server, I highly recommend that it is only used by experienced DBAs. While it offers lots of promise for increased performance, it can just as easily cause performance problems if misused. Backup compression, on the other hand, can be used by DBAs of all skill levels. Excellent summary of row/page data compression… it never made such good sense before. Thanks for sharing!